According to statisticbrain.com, nine percent of Americans eat out three times per week. But do people ever stop to think about what it is like on the other side of the table? 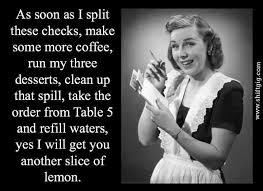 I would like to introduce you to the other side, to what it’s like to be a waitress. Some people choose to make a career out of waiting tables, some do it to get through college, and others – the smart ones! – try it and walk away or don’t even attempt at all. I have been waiting tables for six years now, in various types of restaurants. I have worked for mom-and-pop shops, big chains with strict corporate policies, fast-paced cheap restaurants and expensive fine dining ones. 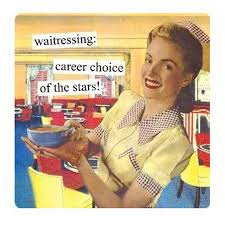 I am the college student waiting tables with a fear of making a career out of it. After six years of waitressing, I would live to reveal some facts that I believe most people are unaware of and should definitely keep in mind the next time they dine out. 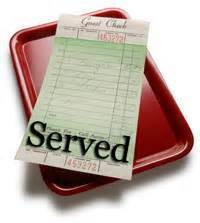 First, servers, the fancy word for waiter or waitress, make $2.13 an hour. That wage has not changed since 1991. After taxes the majority of servers get a paycheck for $0 – that’s without tips, though. That means we work for tips! Second, most servers have a station, so the tables assigned to us for the night become our income and only way to make money. When you sit at my table for four hours and drink water and eat salads, and spend $10 and tip me $2, you just wasted my time when I could have turned the table four times and made four times as much money. Being a waitress can be hard at times, especially when you are responsible for paying other employees your hard earned money. Which bring me to my next point. Third there is a thing called tip out: Servers in Fort Worth, Texas are required to tip out a certain percentage of their sales or tips to bussers, bartenders, and host. These three groups have little to no interaction with the servers guests. Yet, a server is responsible for sharing their tip. This has become a problem and state wide controversy among restaurant employees because the servers only get paid $2.13 an hour and are not guaranteed a tip, servers can easily do a bussers job, and it should be the restaurants responsibility. We pay them, usually four percent of our sales. That means if you just ate in my section and ran up a $100 tab and did not tip me, I still had to pay $4 to wait on you, and you took up my “real estate” for the night. Fourth, we are salesmen and we take time to know our menu. I’m selling a product. I’m the front-line person for the restaurant, like a car salesman. I’m responsible for giving you an experience. But unlike a car salesman, I don’t get commission from my employer. I get paid by you, and you should always tip on a percentage, based on your experience and you feel you had good service. That percentage is 18 to 20 percent, by the way, not five to 10. Fifth, being a waitress means you can make $200 or more in one night and $10 the next. It’s like playing the lottery every day, but that lottery is your food and shelter. You are disposable: no matter how good you are, there’s a million more of you. Restaurants work you and use you and they’re basically getting free labor. Lastly, we are only one person and can only do so much at once. We try our best to complete every task that comes our way. Also another thing to keep to keep in mind is when your food comes out wrong it is not always our fault. Just know there is some talent and skill involved when being a server. We keep smiles in stressful situations, work in a fast paced environment, and do everything in our power to make sure you have a good dining experience. Now that you know this stuff, I hope you could be more considerate to your wait staff the next time you decide to dine out. Have a little more consideration and be polite. 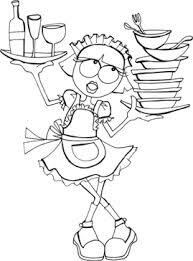 A lot of work goes into serving you and your family when you go out to eat. That’s why servers depend on you to tip them and reward them for trying to provide you with a good experience.